Three years ago American Jason Holmes had never heard of Australian rules football, let alone seen a game. 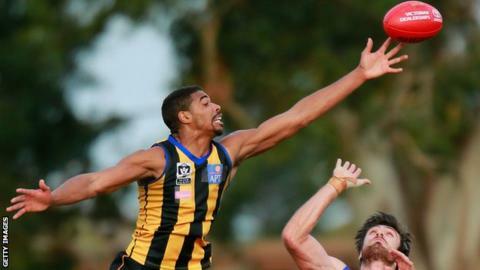 But on Saturday the former college basketball player will make history as the first born-and-raised American to play in the Australian Football League. The 25-year-old from Chicago will make his debut for Melbourne club St Kilda against Geelong Cats at Etihad Stadium. "I don't think it's sunk in yet," said Holmes, who stands at 6ft 7in. "I understand it's a really big thing. But I'm just proud to be a cog in the machine that's going to help this sport grow internationally." It was in 2013 that Holmes watched a YouTube video explaining the rules of the sport and travelled from Chicago to a talent-spotting camp in Los Angeles. He was then picked by St Kilda in the draft as an international rookie and recently signed a one-year contract extension. Holmes comes from a sporting family. His father was a professional basketball player, his older brother Andre plays for the Oakland Raiders in the NFL, and his younger brother Mark plays basketball in Europe. But he says he finds it hard to explain exactly what he is doing. He added: "I've almost started giving up on friends and family back home - 'yeah, the rugby's going well'." What does Pedro bring to Chelsea?